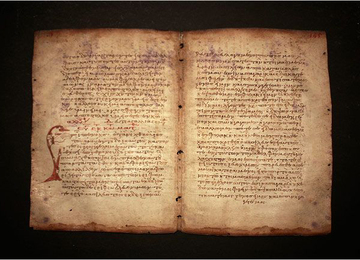 The terms “Ancient Greek texts” and “Ancient Greek literature” refer to texts written in Ancient Greek until before the Byzantine Era. The earliest Greek texts that fully survive today are also the most popular, as they are the Homeric Epics, the Iliad and the Odyssey. They were written around the 8th century BC. Some earlier texts have also been found, but they are written in Linear B, a language used during the Mycenaean Era, and are thus dated to before the 11th century BC; these texts are written on clay tablets and they contain prosaic records associated with trade (inventories, lists, etc). A contemporary of Homer was Hesiod, and two of his works survive today: “Works and Days” and “Theogony”. The first depicts the poverty – stricken country life he was familiar with, talking about rules for farmers. The latter is an account of how the world and the gods were created, along with the Ages of Man. When Greece entered the Classical Period, around the 5th century BC, a Golden Age of cultural and spiritual renaissance started in the city – state of Athens. This period was marked by the appearance of many important playwrights, along with the three great tragedians of Ancient Greece: Aeschylus, Sophocles and Euripides. Today seven tragedies by Aeschylus have survived, including the trilogy “Oresteia”. Another seven tragedies have survived that were written by Sophocles, such as “Oedipus Rex” and “Antigone”. Finally, of Euripides, seventeen tragedies have survived, including “Medea” and “The Bacchae”. Comedy was also on the rise during the Golden Age of Athens. The most important representative of the comedic art was Aristophanes, but only eleven of his works have survived, such as “The Clouds”, “The Birds”, and “Lysistrata”. We owe the information we have gathered today about Ancient Greece tot the works of the historians of that period, the most important being Herodotus and Thucydides. Herodotus is known as the father of history, and his work is the first literary use of prose in Western literature. Thucydides was a more careful historian, though, thoroughly using and citing sources, including documents and conducting considerable research for his work “History of the Peloponnesian War”. A third important historian is Xenophon, who continued the recording of history exactly where Thucydides had stopped. One of his most important works is “Anabasis”, an account of his participation in the Greek mercenary army that helped the Persian leader Cyrus overthrow his brother from the throne. Of course, a number of philosophical works has also survived. Among the masterpieces that created the base for the development of Western thought and philosophy, are works by Socrates, Plato and Aristotle, such as the “Dialogues”, “The Soul”, and the “Poetics”.